Komodo Dragons have landed in New York City; and this has nothing to do with the popular Godzilla movie. Wildlife Conservation Society’s operated Bronx Zoo has opened what they call “Amazing Monitors” habitat for the dragon, also known as Varanus komodoensis which is the largest living lizard species. The zoo is located in the Zoo center building and it is the first time that the zoo has Komodo dragons since the 1950s. The new habitat contains 3 dragons; one male and two females. The exhibit also features 3 more species of monitors that live in very different ecosystems. Mertens’ water monitors also known as Varanus mertensi, yellow spiny-tailed monitors also known as Varanus acanthurus and lives in rocky terrain and Varanus macraei. Each of the lizards is housed in an exhibit which resembles its natural environment. Jim Breheny, Director of the Bronx Zoo, said in a news release that komodo dragons are some of the most amazing creatures that nature has and they are the top predators in their environments. By introducing visitors to Komodo, the zoo management hopes that people will learn the challenges faced by komodo in the wild and hopefully appreciate these unique predators. They hope that their work will inspire the next generation of conservationists who will work in places like Indonesia to help save the vulnerable species. An adult komodo can weigh up to 360 pounds and can be as long as 9 feet from nose to the tip of its tail. However, the dragons in the exhibits measure about five feet an indication that they are still young. The komodo’s diet consists of large and small mammals, smaller komodo, birds’ eggs and carrion. 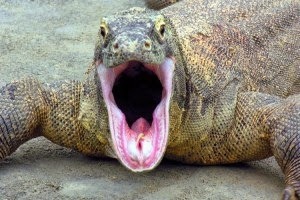 A komodo can consume 80 percent of its body mass in one feeding. Its bite inflicts a severe wound in its prey killing it within a short time.